We are pleased to announce that the Nakamura Keith Haring Collection is welcoming a Miami-based, Brooklyn-born Pop artist Christopher Florentino a.k.a. 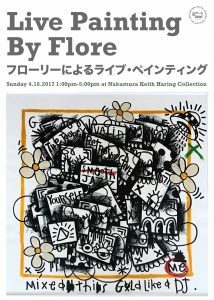 Flore to have his live painting session, Live Painting By Flore, on Sunday April 16th 2017 at the Nakamura Keith Haring Collection. Live Painting By Flore—Flore’s first live painting in Japan—will feature the artist painting in the nature of the Yatsugatake Mountains, which is an unfamiliar environment from his usual metropolitan setting like Miami and New York. After the session, the work will be archived at the Nakamura Keith Haring Collection. Christopher Florentino was born in 1983 in Brooklyn, New York. He is currently living and based in Miami, Florida. Flore is known for his unique approach to merge pop art and street art together, which was influenced by the various 80’s Pop artists, such as Keith Haring. Through his work, he aims to strip down all the “filters” in every day life—rules, stereotypes and other filters that often mask reality—to reveal the truth in life and ourselves.